If you haven't seen Charlie Brown's skull, you should. And, thanks to Michael Paulus, you can. Paulus has drafted detailed illustrations representing the skeletal systems of two dozen popular cartoon characters, from Fred Flintstone to the Power Puff Girls. The two-part pieces show the characters as we are used to seeing them & then, on a separate panel, show us what they would look like in thousands of years in some cartoon-world Smithsonian. The results highlight the anatomical absurdity of the characters. They are simultaneously hilarious & horrifying. 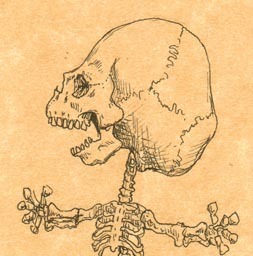 You can see Michael Paulus' work at www.michaelpaulus.com/gallery/characters-skeletons. I met Paulus at his southeast Portland home one February. He showed me his workspace & some of the pieces, & I asked about the success of his skeleton series. MP: It hit more nerves than I ever imagined. I had this little rinky-dink website that was just my portfolio, really. And it just got swamped. Eighty-thousand hits a day, individual visits. And it just went up all over the place. Cartoon chat rooms for kids, hard-core dungeons-and-dragons geeks, video game guys, doctors. Students from Johns Hopkins want to do a Power Point discussion using these. It's just across the board. GOBQ: What do you think the appeal is? MP: I think it's taking these complex characters they've grown up with and taken the distortions for granted. It gives each of them an identity... they're distorted. And these things, they're in our visual vernacular. They're just commonplace. If I was to take lesser-known characters, it wouldn't have had the appeal. People say, "Why don't you make up your own characters?" But that wouldn't make any sense. The novelty wouldn't be there. GOBQ: It really draws out how absurd they are. MP: Yeah. I mean, you're used to these... and then, "Well, what the hell is that thing?" A person wanted to use some of these images for [a lecture on] the inappropriateness of dissecting the human body nature in some cultures. It's a taboo. But it's all completely conjecture and speculation. There's no way to actually dissect Lucy and take her apart. So I'm just going off of what I'm given. GOBQ: I wanted to ask about the research that you did, for the anatomy. How closely are these modeled on actual human skeletons? And how much did you just wing it? MP: I pretty much winged it. That map [a skeletal chart] was like a refresher course for me, just to get the basic structure, just to remember what they are. But some of these, there's just no way these forms would accommodate some of those [bones]. And that's obvious. You know, your femurs, your scapula, and your pelvis... which is all kind of standardized. I didn't go through all the digits or the fingers and all that, obviously. They're so foreshortened, there's just no way. GOBQ: Like, does Pikachu even have joints in his fingers? MP: Yeah, exactly. There's just these, pretty much useless appendages. I don't know. Like I thought, with the Shmoo... I can't tell, I was just under the assumption that the thing was comprised of a lot of blubber or something. People have remarked that the Shmoo doesn't look like he had a lot of body weight. That's the one I've gotten the most criticism with. Obviously I didn't do my research thoroughly enough. 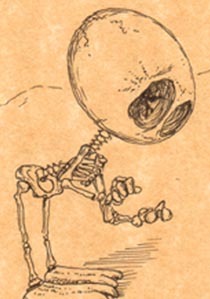 Shmoo would most likely be devoid of any kind of skeletal system, any kind of structure because Shmoo... which was long before my time, in the thirties... I've only seen the image but I have no idea what he did or what his body was capable of, but he was in one of those Wonder Twins, squish-under-the-door, transform-into-whatever gelatinous state. So he might have had cartilage or something, but something less rigid than calcium. GOBQ: Like you, I'd only seen the image, and... putting in the vestigial arms... what made you think he'd have those? MP: [Laughs.] A lot of people really enjoyed that. I was playing with it. I just thought something was missing in the link at some point. So I thought he'd have a strong foundation and these little kind of tyrannosaurus useless top parts that never quite developed, secondary to this foundation... [laughs] ... I'm not sure what the origins were from. Some of these, I don't know where they're coming from or where they're going. I mean, that's another thing... this Hello Kitty. I assumed she had no mouth, that the lower jaw through the ages was absent or just never developed. But then I got a lot of mail from kids. This one girl pointed out ... it's funny, the way she phrased it, but it was really to the point: "I enjoy your pieces, but Hello Kitty does have a mouth. It is under the fur somewhere." And I was just like, Jesus, maybe I'll go back and... I dunno, it's just that I've never seen a mouth on that thing at all. When you get to the Peanuts characters, they're obviously more lifelike. And they have to have actual digits in their fingers, and I gave them human teeth. I know they must have teeth, and things like that. They're the ones that are most human-like of all. [But] I always thought their bodies were really weird. I always thought their heads were weird, and it bugged me. They have these little pin-hole eyes, so close to each other. And that was the one thing, I think it was Charlie Brown that got me to want to do this in the first place. 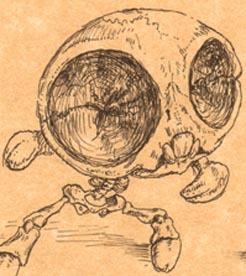 I always just wanted to see what that head looked like, with those little eye sockets and that elongated face. The space between the nose and the mouth is just so big on the Peanuts characters. GOBQ: I wanted to ask you about the decision to overlay the images. How much of it is that you wanted only one to be visible at a time, how much of it is that you wanted to involve the viewer in unmasking this macabre skeleton? MP: The revealing part, where it's interactive, was kind of a secondary surprise. I wanted them, like old biology books... pictures of the human anatomy, and you go through the various levels. Here's the circulatory system, here's the skeletal system, and then you get down into the actual organs and you peel off the spleen and whatnot. It was just translucent plastic. I just loved that. I wanted to duplicate that, and actually have the effect of lifting up. That's why I wanted to do a series. Originally I was debating: well, it would be great to do like the circulatory system or do the organs, but that's just so damn involved. The skeletal system is something that is, for the most part, head to toe. You can actually see it's very form-like. It's more appealing. The nervous system wouldn't have any appeal, it would just look like nothing. GOBQ: I think having them one on top of the other really draws this out, but Hello Kitty is not a cat. Whatever that is, it's not a cat. GOBQ: And I was wondering if you could say a little bit more about the decision to make the skeleton more human-seeming than feline? MP: Well, it's obviously not feline. It was intentional, not so much that I didn't want to do the research in all these. But like, I know this is a cat, and I know... well, I think that's a human. And I know Marvin Martian is a Martian, whatever that is. For the most part, they're all humanoid. Or humanoid-like. They're definitely standing erect. It doesn't walk like a cat, it still has the mental function and capability that's somewhat humanoid, more so than a cat. All these are such strange hybrids... I guess that was intentional, to keep them that way. GOBQ: Has this given you any insight into why the cartoon characters look the way that they do? Why they have these enormous heads? MP: It is revealing, because before I was looking at this I had no idea what it would look like. I mean, the Power Puff Girls obviously have huge eye sockets, but structurally I was curious. That was another reason to do this, I was curious how these things would actually move if they were to be real. One thing I did notice was there's this huge head and a very small body to support it. And I was interested to find that some of this stuff is completely subjective. Obviously, there's eye sockets; but the jaw could be built completely different. Just like people drawing dinosaurs. You look at color schemes... I remember when I was a kid they looked like something and now they look like something else. It's based in fact, but a lot is still open to interpretation. Aesthetics, basically. That's a lot of what science is. A lot of it starts out as speculation. GOBQ: One of the things that struck me about the Flintstones skeletons, they reminded me of the paleontology displays in the Museum of Natural History. And I wondered if that was intentional. MP: That was based directly on the image I found on the internet. I didn't actually pose those. But it is kind of like, like you were saying, like a diorama in a museum or something. The Flintstones characters were the least interesting for me to do, just in the fact that they were so obvious. They didn't vary so much from the human form. Obviously their bodies are, especially Barney was, compressed and he had that strange kind of conical head, and he had the little beady eyes. But Fred had that massive jaw. Some things obviously were really strange distortions, but they weren't nearly as fun as doing the Power Puff Girls or Hello Kitty. But the original push was Charlie Brown. I always just wanted to see what his head looked like. GOBQ: That's interesting, because the Flintstones were actually the ones that struck me the most, how different they looked than people actually look. The characters are clearly representational of people, whereas Hello Kitty is clearly representational of nothing. But I looked at the skeleton and I was like, "Wow, that's not what human skeletons look like at all." And that made me look at the characters again and realize how distorted they really were. GOBQ: But it sounds like that wasn't your experience at all. MP: I guess I was satiated, you know. I went through the Hello Kitty and the Power Puff, and after that... anything looked human compared to that. The Flintstones characters followed after that, and I was like, this isn't quite as fun. I had my cake at the beginning, I guess. It's all relative to the flagship, Hello Kitty. Which has proved to be the most popular. People are just loving that one for some reason. GOBQ: Tell me more about the public response. MP: That was the interesting thing, the letters. I've got, besides the med students and the doctors... this one student was teaching forensic pathology, with the homicide shots, and she wanted to break up her Power Point discussion with images of this. MP: Yeah, exactly. A couple teachers, one in Colorado, I think, and one here in Beaverton [Oregon] want to use these for a class assignment. I got some amazing drawings back from these middle school students... sixth, seventh, eighth grade. She was a science teacher, and they were [studying] anatomy, and the week of the skeletal system, she wanted to know if she could use these as overhead projections. And she ended up, as a class assignment... pick any cartoon character, your favorite, or whatever you want to do, and use these as reference, but draw them, and then you've got to name all their major bones, and their function, and all this. So I got all these letters, and it was great to see, and all these drawings that are really nice. So I'm going to go out there and talk to that class, too. 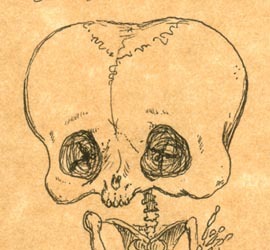 GOBQ: Have you got letters telling you, "This anatomy's all wrong"? MP: I got a couple, a little borderline, some of it's actually classified as hate mail. Recurring. It's happened like three times. (It wasn't the Shmoo guy.) Like, there are these hard-core [fans] who are just taking it way too seriously. For the most part, though, they're all very constructive, little critiques of the characters and how they would move or whatever. GOBQ: Did you conceive of these as homage, or satire, or criticism, or... ? MP: It wasn't like I was bastardizing them or doing anything profane with them. So, homage in a sense. I don't know. I kind of looked at these, and grew up with them. They're so commonplace. I've never been a huge fan of cartoons, I never hated cartoons, they're just... they're such... that one age group, especially since the sixties, kids look at these and they're their friends. And I just wanted to break it up a little bit, and to legitimize them since they are kind of commonplace, with fast food and every other aspect of Americana. I just wanted to legitimize them and just actually see what they are, to dissect them in a subjective sense. MP: I don't know, I guess I draw the line at that. Some of the characters I thought of, and just decided not to do that. Disney characters... I guess I kind of have a problem with Disney. Disney characters just seem too... we're so overwhelmed that they have no identity to me, I just don't care anymore. It wasn't intentional to avoid Disney because of legal problems or anything like that. They're just not at all fresh. I think if it was Disney, the tendency would have been to do something profane. All these characters I've done, I definitely enjoy. It was definitely not to do anything negative with [them], not to critique them individually. Nothing that was so much a [specific] critique as it was a critique of the whole genre or style, what cartoons represent, why they exist. Disney is definitely notably absent, considering their ubiquitous cartoon presence. It's definitely the first thing that comes to my mind when I think of cartoons, but they're just such an old-school thing.